Grow a beautiful flower garden with minimal care by investing a bit of time at the start of the season to reduce on-going care. Always match flowers to the growing conditions and the care you are willing to provide. Low maintenance plants need minimal or no deadheading and staking. This means you’ll be growing good-looking plants with little effort on your part. And if the plants are suited to the growing conditions and resistant to common pests you’ll be doing less work managing insect and disease problems. Further reduce your workload by selecting self cleaning or free flowering annuals and perennials and those bred for long bloom and compact growth. You’ll enjoy more colorful flowers with less pruning and grooming. Ageratum, angelonia, calibrochoa and many of the newer petunia cultivars are just a few of the annuals that do not need regular deadheading for continual bloom. Include perennials like willow amsonia, bugbane, Solomon seal, turtlehead and sedum autumn joy for lower maintenance and big results. Prepare the soil and provide proper fertilization before planting. Work several inches of compost or other organic matter into the top 8 to 12 inches of soil to improve drainage and water holding ability. Incorporate a low nitrogen organic fertilizer like Milorganite at the same time. The slow release formulation provides needed nutrients throughout most if not all of the season. Plus, it promotes slow steady growth that won’t interfere with flowering, is less susceptible to pests and is more drought tolerant. Properly space the plants, making sure they have sufficient room to reach their full size. Overcrowding means you will be thinning or dividing plants more often or battling disease problems instead of enjoying the full beauty the plants provide. 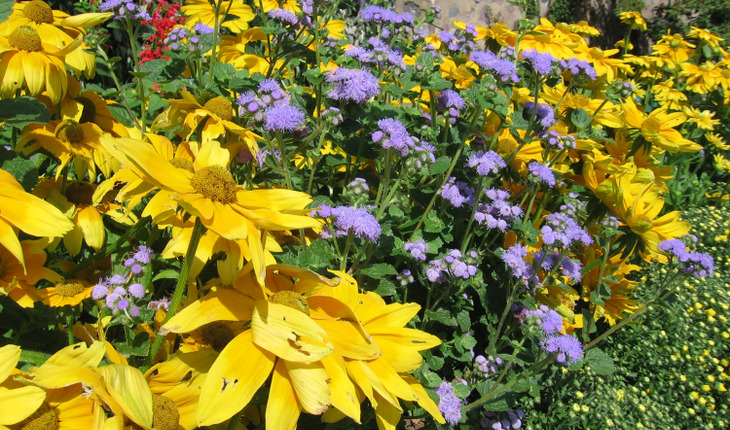 Consider removing flowers on annuals at planting. This allows plants to focus energy on establishing roots instead of flowers. Can’t bear to do this? Then remove the flowers on every other plant or every other row. Then a week or two later remove the flowers on the remaining plants. You will soon be rewarded with full compact plants that will produce more flowers throughout the season. Pinch back long and leggy transplants. Use a hard pinch to remove the tip and several inches of stem. Use your pruners or fingers to remove stems just above a set of leaves. The remaining plant will still look good while you wait for new leaves and stems to grow and produce new blooms. Encourage branching on single stemmed plants with a soft pinch. Remove just the uppermost portion of the stem where the leaves and tip are starting to develop. Soon you will have a well branched plant and more blossoms. Revive catmint and perennial salvia that flop open in the center with pruning. Cut flopping plants back halfway once or twice a season as needed. And don’t forget to mulch. Covering the soil surface with an inch or two of shredded leaves, evergreen needles/pine straw or other organic material will conserve moisture, suppress weeds and improve the soil as they decompose. Always water new plantings often enough to keep the top few inches of soil moist. Once established water thoroughly and only as needed. This encourages drought tolerant roots, so you’ll need to do less watering in the future. With proper planning, plant selection and soil preparation you can keep your ongoing care to a minimum. That means more time to relax and enjoy your beautiful garden. Gardening expert Melinda Myers has more than 30 years of horticulture experience and has written over 20 gardening books, including Small Space Gardening and the Midwest Gardener’s Handbook. She hosts The Great Courses “How to Grow Anything: Food Gardening For Everyone” DVD set and the nationally syndicated Melinda’s Garden Moment TV & radio segments. Myers is a columnist and contributing editor for Birds & Blooms magazine and spokesperson for Milorganite. Myers’ website is www.melindamyers.com.